It is the responsibility of schools and educators to utilize appropriate assistive technology to meet the educational needs of students with disabilities within the least restrictive environment. The use of assistive technology enables educators to adapt content and activities within the curriculum to meet the specific needs of students, and it promotes learning, self-confidence, independence, and a higher quality of life for students with special needs. 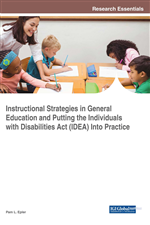 This chapter explores how educators can utilize assistive technology in the general education classroom setting to support students with disabilities, specifically those with sensory, motor, and cognitive limitations. Diverse types of assistive technology devices that students with disabilities can use to overcome barriers to written language, reading, listening, memory, and mathematics are discussed. There are many forms of assistive technology used to improve or support the quality of education for those with special needs within a mainstream general education classroom setting. Support for students receiving special education varies based on their individual abilities, needs, and wants. Assistive technologies, such as voice recognition applications, mobile devices, symbol-based interaction, and virtual reality, are able to support students with different educational necessities throughout the educational experience (Erdem, 2017). Additionally, supportive technologies that assist students’ participation in the learning environment change and develop at a rapid rate. Due to continual advancements in technology, a wide variety of technologies exist and are able to support students in reading, writing, hearing, seeing, sitting, walking, and in developing communication skills (Erdem, 2017).